The Switch connects to Cactus Film & Video in Mexico. Mexico City, May 2018: The Switch® and Cactus Film & Video® have announced the addition of connectivity between Cactus Film & Video’s Mexico City facilities and The Switch’s global network. 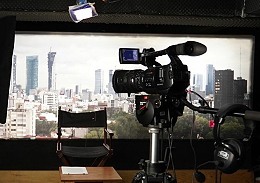 The new connections extend The Switch’s network into Mexico via Cactus, a provider of broadcast solutions in Mexico City, with offices equipped to host international news organizations and productions. Specifically, Cactus Film & Video is connected to the network via The Switch’s recently released The Switch Access™ service, which allows access to The Switch network from virtually anywhere in the world. Additionally, every customer connected to The Switch around the globe will now have access to news coverage coming out of Mexico through both a transmit and receive connection accessible via SwitchIT™, The Switch’s patented and award-winning customer controlled software platform. One of the first of many major events for which Cactus Film & Video plans to utilize The Switch will be news coverage of Mexico’s upcoming presidential election in July.